You know this thing about Kingdom Force Games? Here we are going to present you a whole new category inspired from an animated television series called Kingdom Force. In the Kingdom Force Games category you have a chance to interact with the main character from the series before the animated television series is even released. In Kingdom Force Games you can find 1 games that we've published for these kids and childrens that are interested to play Kingdom Force Games, this game gategory have been created on 12.04.2017. These games with Kingdom Force Games have been voted 1 times and the avarage of vote is 5.00 stars. We advice you to play the last flash game from Kingdom Force Games, Kingdom Force Jigsaw that have been published on 12.04.2017 14:00. Kingdom Force Jigsaw its a part of Kingdom Force Games category and until now its played 517 times. Try it now on Cute-Games.com! If your like the Kingdom Force Jigsaw game you can write a comment in the game page. Recommend this game to your friends if you like it! Find More About Kingdom Force Games! Try all the games from the Kingdom Force Games category if you want to find your favorite one, if you want to have a lot of fun with your heroes from cartoons. Before the series to appear you have the chance to meet the main characters here on our site, the best games site in the country. I can tell you that all the main characters from the new animated television series are some animals: a polar bear, a gorilla, a wolf and so on many others. Those animals are going to unite to form a special intervention team meant to protect their community against villains and natural disasters. They are going to work together to protect the other citizens from danger. In this new animated television series you have the chance to see their missions. Everyday a new disasters happens and they have to make a plan to protect the community. In the first place they have to identify the disaster and its source. After that they have to make a plan in order to decide which vehicles they will use, which vehicles can help them in the mission. Every animal has his own vehicle which can transform in a robot. They have to use those vehicles to rescue the citizens that are in danger and then they have to stop the disaster. The people that are in great danger are the main focus of the team because after all citizens are safe they can continue protecting the city. Only working as a team they can complete their missions. Every character has his unique personality and I am sure you can find at least one that you are going to love. They have to stop the disaster, to make sure that everybody is safe and only after that they can return at their base where they live an ordinary life until the next disaster appears. Before the alarm rings you can watch them at the base playing games, eating, having a good time together as a team and as friend. I think you will enjoy this new animated television series and until it appears you can watch the heroes from the show here on our site in the Kingdom Force Games category. The first game from Kingdom Force Games category is a jigsaw puzzle. You have to solve a puzzle in which you have all the animals that are members in the team. You have them ready for a new mission, in their costumes. In this game you will use the mouse to arrange the pieces from the puzzle in order to solve it. drag the pieces in their place as fast as possible if you want the chance to reach the podium where are only the best of the best. Give us a like if you had fun with our heroes and leave us a comment to tell us what do you think about this new animated television series. We are going to bring you a lot of challenges with Kingdom Force Games so give us a g plus to help us promote this category for all the kids. If you want to reach the podium you need agility, attention and persistence. The game can be difficult so do not give up if you do not earn a big score before the time runs out. In this amazing category you have to do your best to make sure that you will impress the Kingdom Force`s members. They trust your skills so do your best not to let them down in these games appeared in exclusivity on our site. We always do our best to bring you the newest categories for boys and girls so I think you will appreciate our work. 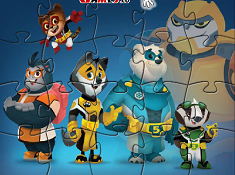 In this category for example the first game if both for boys and girls, I think all the kids will enjoy solving that puzzle with all the heroes from the great rescue team. All the citizens from the city love the rescue team and they are celebrating after every successful mission. Tell us in a comment which characters you think is the leader of the team. If you will watch the animated series when it will appear this year I am sure you will remember the kingdom force games that you have played here on our site. Try to solve this puzzle again and again until you obtain a big score because only in this way you can prove how good are you at puzzles. I am sure you can not wait to see the amazing vehicles that the heroes use in their missions.